Still some weather ups and downs this weekend, but not as wild as the last week! 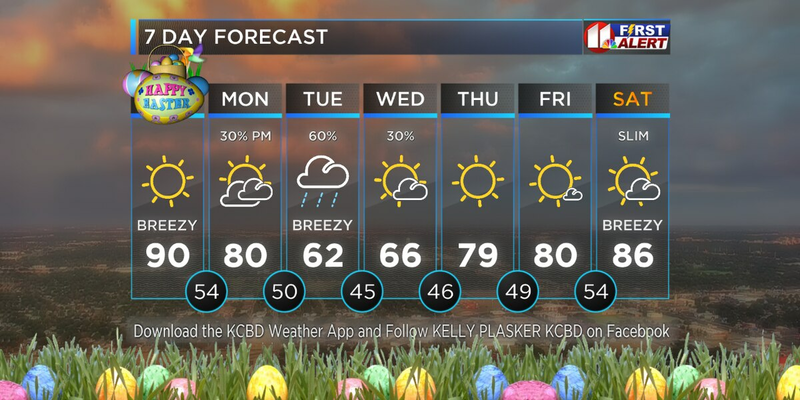 More warmth and wind in the near term, then a chance of rain, and your Easter Weekend. LUBBOCK, TX (KCBD) - The swings in weather we experienced the past week aren’t quite over. We will be much warmer in the near term, but also windy. Windy days, however, are not all equal. Same for warm days. See the accompanying video for the least and most. A milder pattern will continue through Easter, though you will see some ups and downs in my forecast. You’ll also see a chance of showers. Partly to mostly cloudy today with highs in the low to mid-80s, at least ten degrees warmer that yesterday and nearly 20 degrees warmer than Saturday. Those numbers also are in today’s video. Afternoon winds generally will range from 15 to 25 mph with gusts near 35 mph. Not much different tomorrow, though wind speeds will be higher. Partly to mostly cloudy tomorrow with highs from near 80 to the mid-80s. Winds will increase a bit, ranging from 30 to 30 mph and gusting near 40 mph late afternoon and early evening. Elevated to critical fire weather conditions are expected both afternoons. A Fire Weather Warning (aka Red Flag Warning) is in effect for the northwestern viewing area until 9 this evening. When outdoors avoid open flames, keep vehicles and equipment with hot exhaust systems away from dry grasses, avoid activity that may generate sparks (such as dragging chains), and if you are a smoker use extreme care with your ashes and butts. You can view the Warnings using our free KCBD First Alert Weather App. Launch our interactive radar, tap the Menu icon in the lower right (three dots in a circle), then “Alerts", and then "Other" (last option, far right). Close the Menu (tap the x in the circle). Tap anywhere in a shaded area for more information. In this case, you will see a window open with the message "Weather Alerts: High Wind Warning... Fire Weather (Red Flag) Warning... in effect from ... until...."
A slight chance of thunderstorms and rain showers will return Wednesday, though the most likely time for rain is late in the day and overnight. 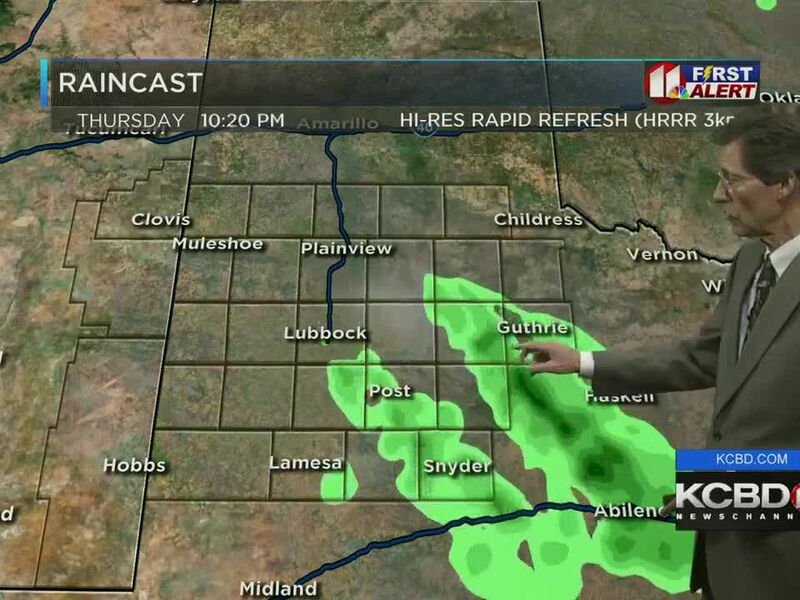 The most likely area for rain and storms is the northern KCBD viewing area. The area least likely to get rain will be the southwestern viewing area. That said, storms and rain will be possible nearly anywhere in our area. 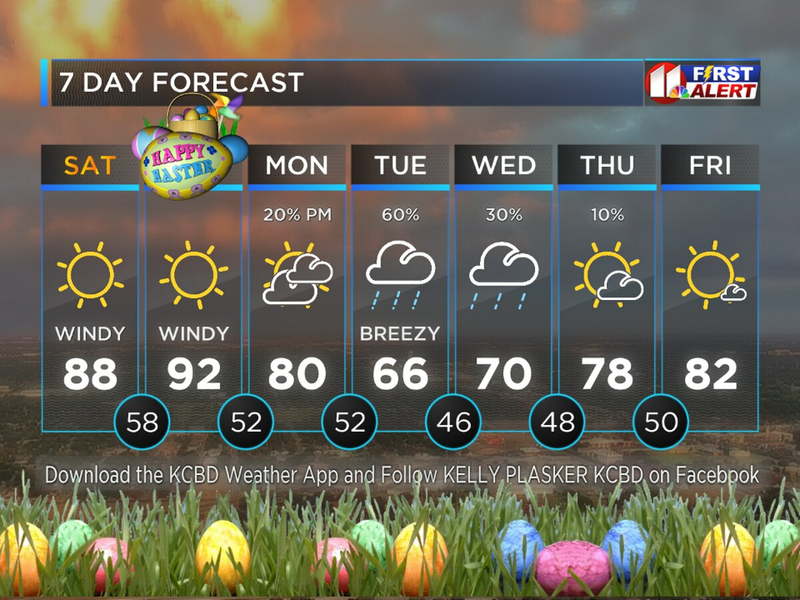 My current forecast for your Easter Weekend is mostly warm and somewhat windy. A cold front is possible Sunday night (or Monday). If it arrives early it could change the outlook. Please watch for updates. 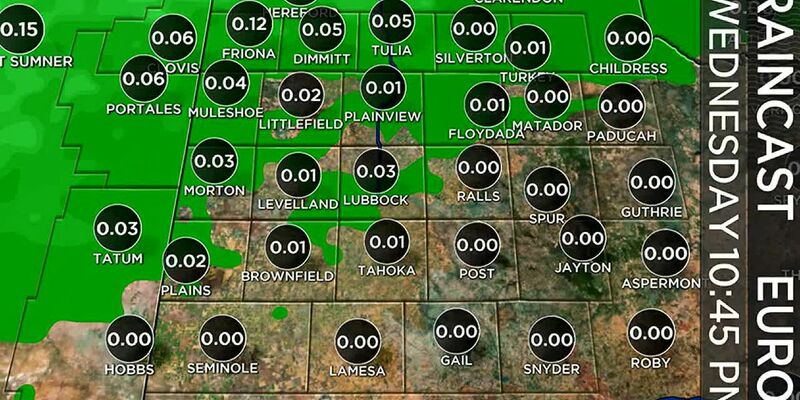 In case you missed the reports of this weekend's significant precipitation totals, you can find them on my Facebook page Steve Divine KCBD. Scroll back to Saturday morning for those (as you do, you'll pass by maps with Sunday morning's reported low temperatures). Amounts were not far from the range I mentioned here Friday of what I expected (from one-quarter inch to over an inch, with a few isolated spots exceeding an inch-and-a-half or even two inches). There were a couple reports via Facebook of greater amounts, the most notable from near Post. Two-and-a half-inches 3 miles north of Post and 5 inches at the Garza County Animal Hospital in Post! While much of Lubbock experienced a heavy frost Sunday morning, officially the city didn't get down to freezing. Lubbock’s low yesterday morning was 33°, twelve degrees below the average for the date. The high of 74° was one degree below the average for the date. The April 14 record low is 27° (1933) and the record high 93° (2006). For today, April 15, Lubbock’s average low is 45° and the high 75°. The record low is 25° (1928 and 2014) and the record high 92° (1925 and 2006). Today's sunset in Lubbock will be at 8:18 PM CDT and tomorrow's sunrise at 7:16 AM CDT. On This Date, April 15, 1973: A rare early-morning tornado struck southwestern and northwestern Plainview between 4:15 and 4:30 AM. Sadly, two people were killed. 26 were injured. About 40 homes were destroyed. It was nearly three years to the day (April 17, 1970) after another tornado ripped along 5th Street, through downtown, across Austin Heights and into Seth Ward. Although quickly overshadowed by the Lubbock tornado a month later, the 1970 Plainview twister covered much more territory with damage reported from near Whitharral in northern Hockley County all the way to Clarendon. One of those killed in the 1973 tornado was David Bryant, a storm spotter who lost his life while providing a warning to others. This “On This Date” is compiled from information from the Plainview Herald, the National Weather Service, Caprock Weather and KCBD.